Beautiful colors of the carpet beetle are created by hundreds of scales covering its back. Hide and hair, Carpet beetles, Anthrenus sp. Twice in the past month, I have discovered tiny beetles on a sunny wall inside my home. These Lilliputians are carpet beetles and measure a few millimeters length. In nature, carpet beetles evolved to eat the remains of dead animals in the latter stages of decomposition. Long after muscle and fat have vanished and only hide and hair remain, carpet beetles and their relatives in the family Dermestidae find sustenance in dead things. Carpet beetles have the remarkable ability to digest the protein keratin that comprises hide and hair. The ability of Dermestidae to clean the plate, so to speak, has been used by zoologists to thoroughly remove the meat and tissue from bones of skeletons prior to scientific study and display. A very hairy larva of a dermestid beetle was discovered inside the decomposing carcass of a squirrel. In our homes carpet beetles eat cloths made of wool, silk, leather, feathers, as well as the fabric of furniture and, yes, carpets. The also eat stored grains, cereal, nuts, spices, and related products. Each female beetle is capable of depositing as many as 100 eggs in cracks in a floor or other protected places near a source of food for the larvae. 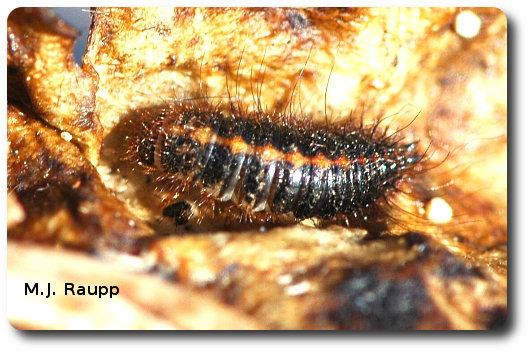 Larvae of the carpet beetles are the real scallywags as they consume fabric and food of various kinds. When infestations are heavy, serious damage to cloths, rugs, and furnishings may result. After feeding for two or three months, the larvae develop into pupae from which adult beetles emerge in a few weeks. The entire life cycle usually takes 4 to 12 months to complete and is dependent on the temperature and the quality of the food. Warmer temperatures and higher nutrition result in more rapid development and a shorter generation time. Some species of carpet beetles may take more than year to complete a generation. 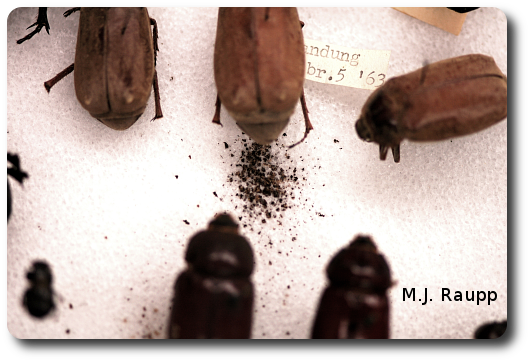 Telltale droppings beneath a pinned specimen in an insect collection are signs of an infestation of dermestid beetles. Adult carpet beetles feed on pollen and are often found on flowers outdoors. The key to eliminating problems with carpet beetles is to find the source of the infestation and eliminate it. If a trickle of beetles turns into a flood, I will marshal my forces and see if I can discover a rogue container of spice in the pantry that might be the source of beetles. Small hairy larvae and their shed skins are often the first and easiest clue to discover the location of an infestation. Perhaps, a well-worn woolen sweater that has lingered too long in my closet needs to find a new home in the trash. Maybe a small field mouse has joined his ancestors in the Promised Land and his little carcass is feeding carpet beetles in my attic. One can only hope. A common breeding ground for carpet beetles is in the cadavers of dried specimens of insects. Carpet beetles are serious pests in museums where collections of insects and other animal specimens are stored. Surely, an inspection of my insect boxes is in order. Practices that can help keep carpet beetles at bay include the regular vacuuming and cleaning of carpets and rugs. A steam-cleaning of floor covering kills the immature stages of carpet beetles. Clothes, especially woolens and furs should be professionally dry cleaned and stored in airtight bags. Infested furs may need a period of cold storage to eliminate infestations. On these sunny days of waning winter, keep an eye out for these tiny recyclers in your home. For more information on carpet beetles, please visit the following web sites.